“Sing to me oh Muse”… The Nine Muses of the Greek Mythology were deities that gave artists, philosophers and individuals the necessary inspiration for creation. Hesiod reveals that they were called Muses or Mouses in Greek, as the Greek word “mosis” refers to the desire and wish. The word museum also comes from the Greek Muses. All the ancient writers appeal to the Muses at the beginning of their work. Homer asks the Muses both in the Iliad and Odyssey to help him tell the story in the most proper way, and until today the Muses are symbols of inspiration and artistic creation. In painting the Muses are usually presented as ethereal women with divine beauty, holding laurels and other items depending on their faculty. According to the Greek Myths, God Zeus bewildered the young woman Mnemosyne and slept with her for nine consecutive nights. The result of their encounter was the Nine Muses, who were similar to everything. Μnemosyne gave the babies to Nymph Eufime and God Apollo. When they grew up they showed their tendency to the arts, taught by God Apollo himself. They were not interested in anything of the regular human everyday life and they wanted to dedicate their lives to the Arts. Apollo brought them to the big and beautiful Mount Elikonas, where the older Temple of Zeus used to be. Ever since, the Muses supported and encouraged creation, enhancing imagination and inspiration of the artists. According to the Greek Mythology, two Muses invented theory and practice in learning, three Muses invented the musical vibrations in Lyre, four Muses invented the four known dialects in the language – Attica, Ionian, Aeolian and Dorian – and five muses the five human senses. Seven muses invented the seven chords of the lyre, the seven celestial zones, the seven planets and the seven vocals of the Greek Alphabet. 1. Clio: The Muse Clio discovered history and guitar. History was named Clio in the ancient years, because it refers to “kleos” the Greek word for the heroic acts. Clio was always represented with a clarion in the right arm and a book in the left hand. 2. 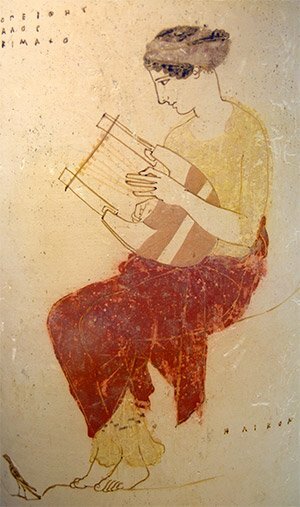 Euterpe: Muse Euterpe discovered several musical instruments, courses and dialectic. She was always depicted holding a flute, while many instruments were always around her. 3. Thalia: Muse Thalia was the protector of comedy; she discovered comedy, geometry, architectural science and agriculture. She was also protector of Symposiums. She was always depicted holding a theatrical – comedy mask. 4. Melpomene: Opposite from Thalia, Muse Melpomene was the protector of Tragedy; she invented tragedy, rhetoric speech and Melos. She was depicted holding a tragedy mask and usually bearing a bat. 5. Terpsichore: Terpsichore was the protector of dance; she invented dances, the harp and education. She was called Terpsichore because she was enjoying and having fun with dancing ( “Terpo” in Greek refers to be amused). She was depicted wearing laurels on her head, holding a harp and dancing. 6. Erato: Muse Erato was the protector of Love and Love Poetry – as well as wedding. Her name comes from the Greek word “Eros” that refers to the feeling of falling in love. She was depicted holding a lyre and love arrows and bows. 7. Polymnia: Muse Polymnia was the protector of the divine hymns and mimic art; she invented geometry and grammar. She was depicted looking up to the Sky, holding a lyre. 8. Ourania: Muse Ourania was the protector of the celestial objects and stars; she invented astronomy. She was always depicted bearing stars, a celestial sphere and a bow compass. 9. Calliope: Muse Calliope was the superior Muse. She was accompanying kings and princes in order to impose justice and serenity. She was the protector of heroic poems and rhetoric art. According to the myth, Homer asks from Calliope to inspire him while writing Iliad and Odyssey, and, thus, Calliope is depicted holding laurels in one hand and the two Homeric poems in the other hand. The Nine Muses have been inspiring artists since the antiquity and there countless paintings, drawings, designs, poems and statues dedicated to them. All artists of the Renaissance acknowledged their importance in artistic creation, dedicating their works to the Muses. Today, the most famous depiction of the Muses in sculpture is in Greece, in Corfu; the Empress Sissi of Austria had their statues made for her, in order to ornament the garden of her retreat house in Corfu, the famous Achilleion. Who could help me to write my paper online as soon as possible? You should check over here essayup.com writing service is always ready to answer the call! 🙂 great info! it helped A LOT!! thanks a lot you helped me with my speech!!!!!! i think you spelled the one specializing in stars wrong though…..I’ m not quite sure. One theory holds the nine stripes on the Greek flag represent the nine muses. The more popular belief is that the nine stripes represent the nine syllables in the Greek words meaning Freedom or Death, though I can’t remember the word for freedom. I’m a Student this helped me a whole bunch. awesome site. it helped me a lot on my research assignment. Thank you for the informative information about my name Euterpe. For many years and, it still is, very difficult for people to pronounce my name. I would like to know why the second letter of the name is written with the Greek letter u instead of the English letter f since the rest of the letters are in English? It is pronounced differently when written with the u instead of f.
PS: Would be nice to start a club with people named Efterpe. I’m an Honors La Students and thanks a lot, this really made it easy to get info on the Nine Muses! Hi, the Muses were raised by Apollo and the Nymph Eufime. WOW! Great site. Thanks a lot. This helped me greatly on my muse project. WOW! Thanks a bunch with helping me with my english project over The Ancient Greek Muses. It helped a lot. I’m appealing to the muses to help me finish my second novel. It’s a tough one, but it’s about artists and writers in 1950’s San Francisco, so I’m sure I’ll get their help. I’m anxiously waiting. This was very informational, but Erato can also be known as the muse of lyrics. I believe that Melpomeni is spelled with an e not an i. And I also believe that Polymnia can also be spelled Polyhymnia hence the word hymn in it. Calliope had a son named Orpheus btw. Other than spelling errors, this was very well written and full of information. This helped a lot in my search for more information on the Nine Muses. So whoever came up with this, thank you for giving out this information. Very thorough and accurate. This is the base of the old but famous movie Black Orpheus. I had no clue what the muses are, but then i found this great website (this one) and I have tons of facts for my paper! Thank you! Our Boston Terrier is named after the chief muse Calliope …Callie for short. We love her. I found this web page extremely interesting and useful. I got basic information about the Nine Muses here and would like to read more advanced writing. Not just a-musing, but intriguing too. Nice linkage to the old, inspiring the new!